Dr. Bristow is a Texas girl to the core. 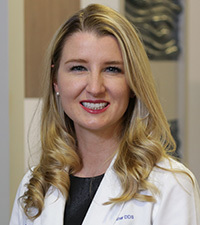 Growing up in Mesquite, she traveled across Texas to study at Baylor University for her undergraduate degree and to Houston at the UT School of Dentistry for her Doctor of Dental Surgery degree. Capable of providing dental implant placement in-house to save our patients from having to run between different offices. An expert at giving beautiful smile makeovers to patients with both minor and major dental problems. Deeply tied to the community; she frequently donates her services to the underprivileged communities in Dallas who normally don’t have access to basic dental care. Dr. Bristow believes giving back to others is a must when blessed with the ability to practice any sort of field involving medicine. She has been on mission trips to Mexico and Guatemala, donating free treatment to locals in need. She also participated in the Texas Mission of Mercy event, honoring our veterans. She assisted in the expansion of a Dallas dental clinic that provides free care to residents who qualify. She started out with North Dallas Shared Ministries, donating her time there every Monday after graduation. After a year had passed, the program grew to a five-day-per-week training for dental students attending the Baylor College of Dentistry. In 2012, she led the fundraiser for 21st Century Dental to raise over $2,000 for the Special Olympics Texas and celebrated with the organization by rappelling down the side of a 15 story building. Dr. Bristow loves exercising (barre classes, yoga, spin, you name it) in her spare time. Also a health food nut, she is always excited to swap recipes and discuss healthy lifestyle choices. Much to the dismay of Dr. Smith and Dr. Roy, she does love to travel. Surfing in Costa Rica is one of her favorite spots and it’s likely she will pick your brain for great destinations if you’re up for sharing your experiences. She lives in downtown Dallas with her three-legged golden retriever named Blaze. Dr. Bristow is an active member of the Golden Retriever Rescue of North Texas and served as a foster home for pups in need. She did become a "foster failure" and adopted sweet Lucy Lu in 2012. She then adopted Blaze in 2017. She can be heard talking about dogs of all types anywhere in the office. She’s been known to give out doggie bandanas to patients who are fellow dog lovers.